Article by Joe Rodgers ©. During a recent holiday in the south of England I joined a party of enthusiasts on a visit to Filching Manor Motor Museum, Jevington Road, Near Polegate, East Sussex. 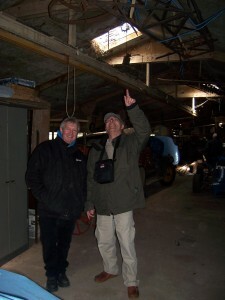 At the start of the tour, over coffee in the Medieval Manor, the proprietor, Karl Foulkes-Halbard (pictured with me), explained that his museum exhibits were rather extraordinary in that without exception they were all record breakers, winners or historical firsts of one type or another. And what a magnificent collection we were then privileged to see and, amazingly, there among Sir Malcolm Campbell’s Bluebird K3 in which he took the water-speed record on Lake Maggiore on 1st September 1937; several Campbell cars; Fangio’s very own racing car; a selection of other cars including Bugattis, Mercedes and a Formula 1 winner; various record-breaking motor cycles and boats was the exhibit that really set my pulse racing. In the collection was the 1912 Portlaoise Aeroplane on which my father, William Rogers, had worked, the FIRST Plane to be manufactured and flown in the now Republic of Ireland by Aldritts of Portlaoise or Maryborough as it was 100 years ago in 1912. 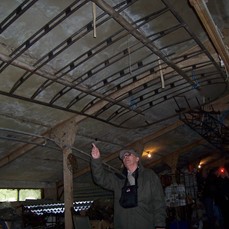 What a thrill it was for me to see the massive wings with the two main spars in each wing consisting of rather large round bamboo poles to which a total of 15 cross-members or ribs of a lightweight timber are attached – the canvas covering having long since gone. The fuselage too, minus its outer covering of course , is in remarkably good condition, complete with tail assembly, cockpit, seat, rudder bar and pedals. The complete aircraft including both large wings and fuselage well preserved after 100 years and would be easy to restore to its original condition. Port Wing, 1912 Portlaoise Plane. As I come from Portlaoise this was a wonderful sight to behold. I remember as a schoolboy at CBS Tower Hill seeing daily a propeller over the entrance to the old Aldritt works, corner of Railway St & Tower Hill. My father told me to what it related and now I’ve seen the aircraft to which it belonged, a craft powered by an engine also designed by Aldritts, the history-making flight recorded as having taken place over the Great Heath of Maryborough. ould personally love to restore it, time and money permitting, and all other on-going restorations completed. The party wondered, as indeed I did, as to why this rare craft which had put Portlaoise on the map as the birthplace of Southern Irish aviation, had not been restored there and put on show as a memento of bygone achievements. I wonder how many people in Portlaoise are aware of this momentous happening in their relatively recent history? I am of the opinion that Laois County Council, who went to extraordinary lengths and unnecessary expense in the 1980s, to overturn old Market Laws and ban the holding of Markets in the Portlaoise Market Square would have been better occupied erecting a Flying Machine in that same Market Square to highlight for posterity the avionic achievements of some former townspeople. I have noticed that towns throughout Scotland, England and Wales, obviously with the intention of attracting tourists, highlight, promote and honour objects of much less historical value that the Portlaoise Aeroplane. Why is their such apathy in Portlaoise towards this very rare gem? The very first plane to be manufactured and flown in Ireland! Joe Rodgers joined the Irish Army Air Corps on leaving school and served as a Meteorologist/Air Traffic Controller. Trained at Collinstown (now Dublin Airport) he served at both Baldonnel and Gormanston airfields. Joe moved to England on discharge and was employed by the Co-operative Wholesale Society achieved the position of National Buyer (Men’s Outerwear) at their Leeds HQ, buying for 800 Retail Shops in England and Wales.